Your body needs omega-3 fatty acids to function, but most people don't get enough of them. Here's how omega-3 foods and supplements can raise your body's levels and benefit your health. Omega-3 fatty acids are a type of healthy fats with many health benefits, including quicker workout recovery. They are called essential fatty acids, meaning you have to get them through food or supplements. They can't be made by our bodies. Omega-3 supplements are one of the most important things to add to your vitamin and supplement stack. Fish oil is one of the easiest ways to make sure you get enough of these important fatty acids. There are three omega-3 fatty acids: eicosapentaenoic acid (EPA), docosahexaenoic acid (DHA), and alpha-linolenic acid (ALA). EPA and DHA are found in fish. They are also known as polyunsaturated fatty acids (PUFAs), or long-chain fatty acids. ALA comes from plants like chia seeds and walnuts. The body has to convert ALA to EPA and DHA to be able to use it, so it's a less efficient source of omega-3. It takes a lot of ALA to make a little EPA and DHA. It's a lot easier for the body to use EPA and DHA fatty acids from your diet. This is why fish, or fish oil, is so important. What's the difference between omega-3 and omega-6? Omega-3 is often talked about in the context of omega-6. Omega-3 and omega-6 are two different types of polyunsaturated fatty acids, or PUFAs, which are healthy fats. Your body needs both kinds to stay healthy. It's easy enough to ingest plenty of omega-6 from foods like nuts, eggs, chicken, and vegetable oils, but it's harder to get enough omega-3 foods to meet your needs. The best food source of omega-3s is fish, but many people don't eat a lot of seafood. What are the health benefits of omega-3s? These healthy fatty acids are one of the most popular supplements for good reason. They have several benefits for fitness and general health, especially if you work out. Although there isn't strong evidence in omega-3s directly assisting in fat loss, supplements like fish oil may help you feel fuller for longer. That can make it easier to stick with your diet, helping you lose weight. Are there interactions among omega-3s and other supplements or drugs? According to the National Institutes of Health, omega-3s are considered safe for all human populations. Omega-3s are even recommended for pregnant and breastfeeding mothers, although it's important for them to find a mercury-free source of fish oil. But, if you use anticoagulant drugs or have a shellfish allergy, omega-3s might be a problem, so talk to your doctor to see if it's safe. 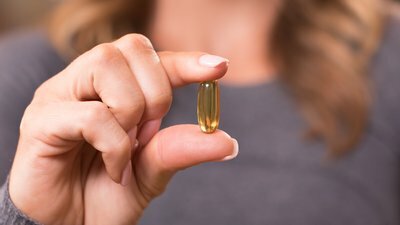 What are the side effects, if any, of omega-3 supplements? It's hard to take too much fish oil. But, if you're taking a lot and noticing an upset stomach and loose stools, back off. Another unpleasant but harmless side effect you might get is a case of the "fish burps," which are exactly what they sound like. What are good omega-3 foods? Wild-caught fish like Atlantic salmon, mackerel, tuna, herring, and sardines are great omega-3 foods. Since this nutrient is a fat, you'll get more of it when you choose fattier fish, like salmon. Don't worry about racking up too many calories from fatty fish. Your body needs fat to be healthy and even to fuel your workouts. Omega-3 is one of the best forms of fat there is, so consider it a health food. It's highly unlikely your diet will be derailed by eating too much fish. Grass-fed beef is also a good source of omega-3 fats. Grain-fed beef has a lower omega-3 content and more omega-6s, which most of us get plenty of already. Animal foods like fish and grass-fed beef have lots of EPA and DHA, the omega-3s that are easiest for your body to use. Plant-based forms of omega-3s include chia seeds, walnuts, and leafy greens. If you get your omega-3s from plants, remember that the form of fatty acids they give you is alpha-linolenic acid (ALA). You need a lot of ALA to make high enough levels of EPA and DHA, so eat a lot of these foods and consider a supplement. What is the recommended omega-3 intake? You can get enough omega-3 by eating 12 ounces of fatty fish twice per week. If you don't eat that much fish, a supplement will help you get enough of these fatty acids. For overall health benefits, a safe intake of omega-3 fatty acids is 3 grams per day. Most fish oil capsules contain around 1 gram (around 180 milligrams of EPA and 120 milligrams of DHA), so you can take three pills a day. If you're athletic and want to take omega-3s to fight muscle soreness from exercise, take 6 grams per day. What happens if you don't get enough omega-3s? Omega-3 fatty acids are important for overall health. Since they play a part in preventing muscle soreness from exercise, you may find yourself getting more sore more often if you don't get enough. How should you take fish oil? You can buy fish oil as a liquid or in capsules that you take like a vitamin. It's important to get a high-quality omega-3 supplement. Look for one that is mercury free. Taking your omega-3 pills with meals is good because it could help you feel more full. It also helps avoid the "fish burps" and digestive issues that might arise if you take them on their own. Store your fish oil in a refrigerator or freezer. Always talk to your doctor before starting fish oil or any new supplement. 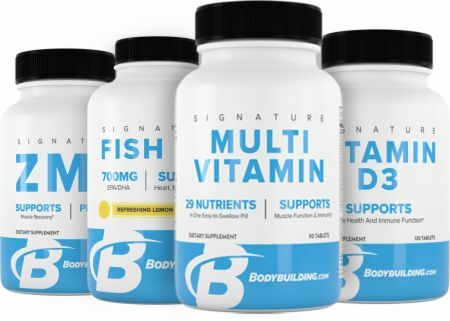 A hand-picked combination of health-promoting supps to help you feel your best! Jouris, K. B., McDaniel, J. L., & Weiss, E. P. (2011). The effect of omega-3 fatty acid supplementation on the inflammatory response to eccentric strength exercise. Journal of Sports Science & Medicine, 10(3), 432. Tartibian, B., Maleki, B. H., & Abbasi, A. (2009). The effects of ingestion of omega-3 fatty acids on perceived pain and external symptoms of delayed onset muscle soreness in untrained men. Clinical Journal of Sport Medicine, 19(2), 115-119. Parra, D., Ramel, A., Bandarra, N., Kiely, M., Martínez, J. A., & Thorsdottir, I. (2008). A diet rich in long chain omega-3 fatty acids modulates satiety in overweight and obese volunteers during weight loss. Appetite, 51(3), 676-680. Mandy Wray, MS, currently holds a position as a graduate research assistant and is working toward her doctorate in exercise physiology at the University of Kansas.